FOUR minutes… scarcely enough time to make a piece of toast, let alone savour all aspects of a TAC Cup debut, but if that’s all Dandenong Stingrays’ midfielder Reece Piper receives this year then he’s happy with it. 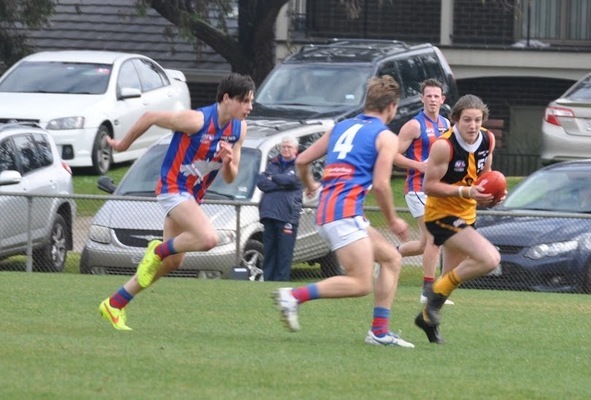 Piper, 16, from Berwick, is officially the youngest player on any TAC Cup list this year, but in spite of his age he barrelled head-long into the side that took on Oakleigh Chargers, after an impressive senior debut with Berwick and some promising under-19’s form. After taking his jumper – number 53 – and getting into the thick of it early, Piper’s debut ground to a screening halt after a sickening collision with the boundary-line fence left him writhing in agony – requiring a trip to Dandenong Hospital by ambulance. But Piper’s actions in that moment show his mindset – trying to affect a spoil and give his side another chance to go forward – it was just horrendously unlucky that his attempt was on the wrong part of the ground. “I remember trying to give him some room – so the other bloke that was kicking to him had an option – and then I had him over the leg-speed, gave him the extra room and make sure I could get to the next contest and spoil it,” Piper said. He was cleared of major damage on Saturday evening as tests showed he had torn some of the ligaments in his back – utter relief considering how bad it could have been potentially with a broken back or fractured vertebrae. “Obviously was just ligament damage in my lower back after getting all the results – but the first thing I thought it was either a broken back or a fractured vertebrae – so I was just hoping for the best result,” Piper said. “I could feel my fingers and toes… but I couldn’t feel… could say from quad up to my lower back… couldn’t feel anything there. But just getting those four minutes on field and receiving his inaugural Dandenong jumper make the experience well worth it – despite its sudden end. “I was enjoying the match after my four minutes on – it’s disappointing and heartbreaking when I came off and realise I couldn’t play the rest of the game,” Piper said. “I was quite emotional when I received my jumper off Blacky (Dandenong coach Craig Black) and my dad presenting it to me before the game. “Being out there with the boys… having those four minutes out there was an exciting time for me”, Piper said. “I’ve never been that excited – to play with the Dandenong Stingrays as a 16-year-old in an under-18s TAC Cup game – I just felt quite proud of myself for getting that achievement. “Even though I only played four minutes, I can look back and say I’ve played a TAC game at 16. Up until the accident, 2015 was a year of unending success for Piper as he earned a spot in Berwick’s senior line-up for Round 1 and continued to push on the door until the Stingrays’ couldn’t help but add him to the side. That small taste of TAC Cup football will drive Piper to get back into the ranks in 2016, while powering through his rehabilitation and hopefully returning to the field later this year. “I’ve just got to rest up now and keep my body healthy for next year,” Piper said. Piper wanted to thank the Stingrays for the opportunity and his family and friends for their support and being there for him throughout his football journey.